After almost three years of dating my boyfriend, I am still amazed by how well he knows me. We recently exchanged belated Christmas gifts, and I cannot explain my excitement upon receiving this Zara duster coat. I mean seriously, how me is this piece? I had been searching for a black duster for a while, but could never find the right quality for the right price. This particular coat is absolute perfection because the thicker material prevents the usual wrinkles of many others I've seen. I am anxiously waiting for warmer weather so I can wear this as outerwear! 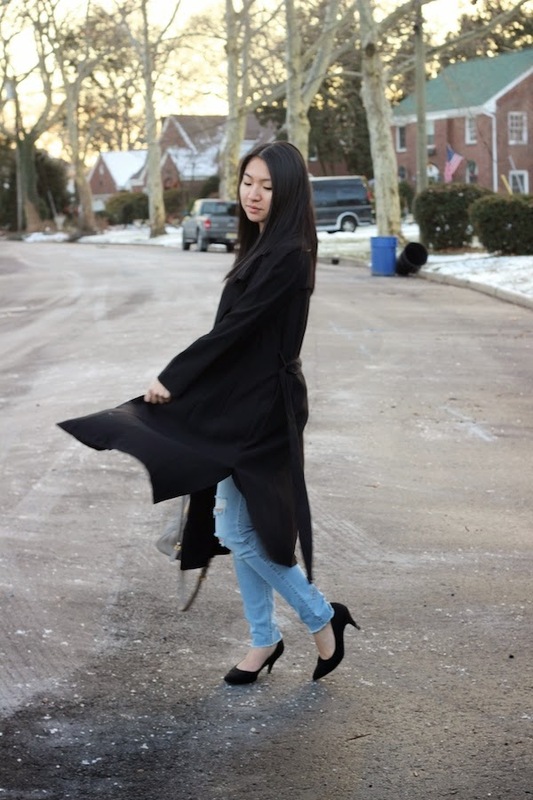 To style the coat, I paired it with my go-to basics for an everyday look. You can never go wrong with a t-shirt and jeans, regardless of how simple that may sound. You know those days when you don't want to think about your outfit and still manage to look put together? This is for those days. Gorgeous look, love the black coat. Haha thanks, Ada! Glad you think so! The duster coat really flatters your style! Very nice! The coat looks amazing on you!! Such a great choice, so sweet!! love how you paired it with your basics!!! :D great bag too!! That's so awesome! Super cute coat. My boyfriend would never be able to pick something out for me even after all this time so he always begs me for ideas!